I was on the phone to the writer Will Self on Sunday. I've been to see him read a couple of times, but I don't know him personally. I just stopped at a phonebox in Edinburgh's Bristo Square and answered the call. 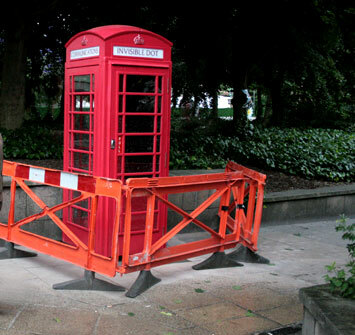 The phonebox is a Fringe Event - an elaborate visual communications hoax. It's one of several that have been erected across Edinburgh during the last couple of days by a theatre company called The Invisible Dot. Invisible Dot acquired the ex-BT kiosks, had them fitted with the appropriate software, then installed them on the streets of Edinburgh. They have been slightly tweaked to make it obvious that they aren't the real thing - they have a slightly pinkish livery, not the standard red, they carry the INVISIBLE DOT name in the top section, and they don't accept coins. When you pick up the receiver, instead of hearing the dialling tone, you get a recording of someone reading a short story. Which is how I heard Will Self. Apparently, other writers who have recorded their work for this project include DBC Pierre, Paul Muldoon and Julia Donaldson. The phoneboxes will run from the 6th till the 30th August.